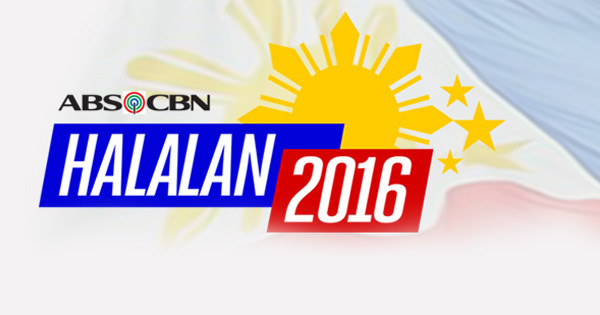 Sunday, March 20, 2016 saw the second of three Philippine presidential debates. It was a dramatic event behind the scenes and on the debate stage. In today’s social media-obsessed world, especially in the Philippines, anyone and everyone can give their opinions or make comments, valid or not. And when it came to this #PiliPinasDebate2016 (emphasis on the hashtag because the Philippines loves to trend), there is much to discuss. Today, I hope to discuss not so much the content (positions, policy) of the debates, but the format, its presentation and the participants. This will be a media critique after all. But in the interest of full disclosure, I will first say that I’m not even eligible to vote in the Philippines since I was born and raised here in the United States. Of course, that doesn’t preclude me or anyone else from being able to comment about this election cycle or the media covering it. And being that I can’t vote, I don’t necessarily have a horse in this race. 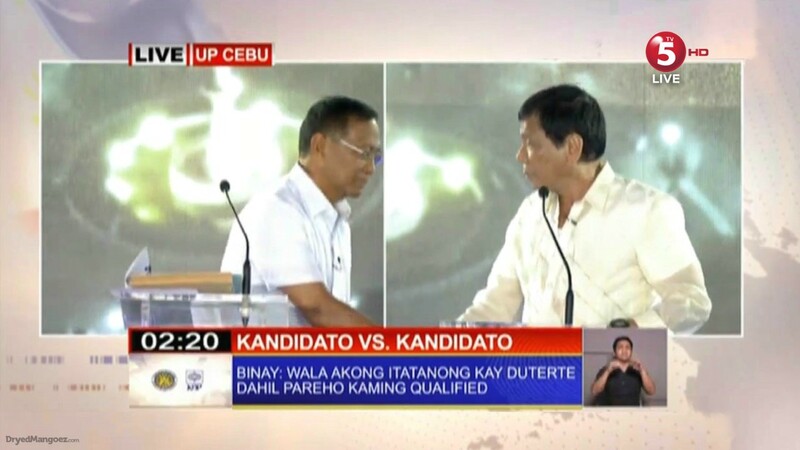 Though I certainly have opinions on each of the candidates, any observations I may have here will, as much as possible, be rooted in basic facts (complete with queued up links to the relevant scenes on the official TV5 YouTube upload of the debate). This year’s presidential campaign here in the United States has been exciting, dumbfounding and downright scary. And the biggest highlights (lowlights?) of the campaign have been the debates. Record-breaking ratings proved the primary debates for both the Republican and Democratic parties interested millions of people, including those who probably a year ago would have never even thought of watching a debate. The debates have been both explosive and informative. Candidates faced off. Their positions, policies, records and previous statements were challenged by the moderators and their rivals. They went on the offensive and went on the defensive. Polls and eventually actual primary and caucus votes showed that the debates had a measurable effect. So how surprised and disappointed was I when the first #PiliPinasDebate2016 happened last month. I was very excited. Watching the US presidential debates got me very hyped to see Filipinos, especially this group of five candidates, go at it as well. But then the debate actually happened. Not only was I surprised and disappointed, I was also confused and upset. That was a debate? No, it couldn’t have been. Impossible! Illogical! I still remember watching the 2000 debate of George W. Bush and Al Gore with the classic head nod. Or “hockey mom” Sarah Palin facing off against veteran senator Joe Biden in 2008. Or CNN’s Candy Crowley live fact-checking Mitt Romney in 2012. So I thought, now in 2016, that I am more than familiar with what a presidential debate actually entailed. The first #PiliPinasDebate2016 made me question that assumption. “Moderators” Mike Enriquez and Jessica Soho, both respected and veteran journalists, were mere talk show hosts. There was no moderating involved. Hell, they had Philippine Daily Enquirer editor John Nery pick questions out of a Miss Universe fishbowl. The format pit candidates against each other for random questions, hoping for spirited exchanges. Instead, many of the candidates either didn’t address their opponent in said face-off or refused to challenge that opponent, some even complimenting them instead. In an actual debate, the moderators and panelists, if present, would have made the preparations that actually tailored specific questions for each candidate with notes on which other candidates may have an opposing view or opinion from each candidate’s possible answers. American debate moderators like Fox News’ Megyn Kelly, Bret Baier and Chris Wallace or CNN’s Anderson Cooper, Wolf Blitzer and Jake Tapper regularly talked about the preparations they made to ensure they ask the right questions. Included in that preparation is knowing or expecting the candidates’ answers and having follow-up questions ready to either flesh out the candidates’ position or bring up an opponent’s view. At the very least, the moderator/panel should have a wide range of knowledge on the topics to be discussed. It was apparent neither Enriquez, Soho or Nery did any such prep for the debate and could have just as well read out questions written by political science students interning at GMA News. Not only did they fail to foster discussion and actual debate, they actually stifled any possible debate by strictly adhering to the short clock and giving zero concessions to allow a candidate to continue speaking. The relatively short one hour, 33 minute runtime also didn’t help. Why this was all surprising is because GMA News and Public Affairs is widely considered one of, if not the best multimedia news organization in the Philippines. I’m sure ABS-CBN fans will argue with that. After all, Philippine media is basically a duopoly between the networks of ABS-CBN and GMA. But a very common criticism of ABS-CBN News is that they tend to be abnormally #biased. That is, more so than most news organizations in the Philippines. And in the last six years, ABS-CBN News has been accused of leaning and being sympathetic towards the Liberal Party and outgoing President Noynoy Aquino. So for GMA News to have produced such a poor “debate” was very surprising to many people. But maybe it wasn’t all GMA News’ fault. And we’ll get to that, and the greater issue here, in a little bit. After the GMA debacle, many people (myself included) hoped, prayed, wished and directly asked TV5 to basically not do what GMA did. That the first debate wasn’t a debate at all and the format should absolutely be fixed for the second of three debates. Now there was a lot of skepticism of TV5’s ability to even host such an event. TV5’s news division, News5, has long been derided as amateurish and low-class by the Filipino netizen class. Whether it’s because of the lack of veteran and experienced journalists or its low ratings by being the #3 network in a television landscape controlled by a duopoly or the pesky #NetworkWarCulture where television networks actually have blind loyalists (or to put it bluntly and in netizen terms, “fantards”) that unnecessarily attack competitors. But, one must not judge something before actually seeing it or before it even happens. I did fully expect, however, TV5 to do a much better job than the host of the first debate. TV5/News5 is well aware of the (sometimes baseless) criticism, so you can be sure as hell that they made sure not to screw this one up. Then came the most unexpected situation. Back On Track? Or Off the Rails? 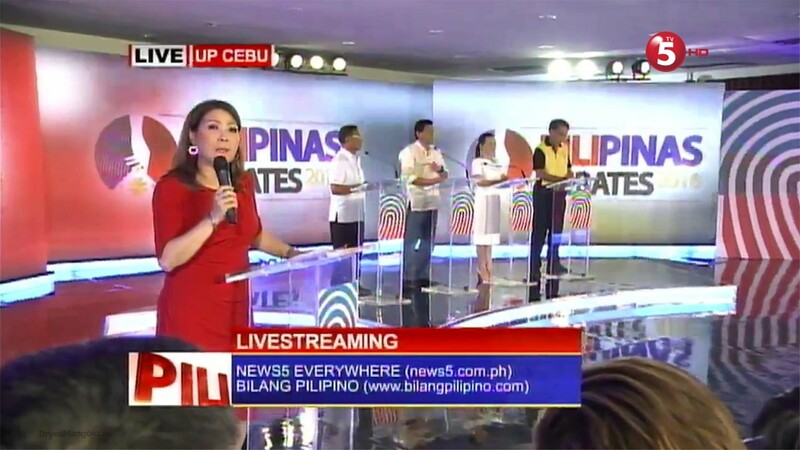 A debate scheduled for 5pm Philippine Time still had not started an hour later. News5’s Cheryl Cosim, Roby Alampay, Atty. Mel Sta. Maria and De La Salle University professor Dindo Manhi were just as clueless to what was happening in Cebu as the average viewer was. They ensured that TV5 was all systems go on their end and that the delay was being caused by some kind of disagreement or misunderstanding that needed to be ironed out. The unknown and the contradictory and wildly speculative reports on social media by various media organizations (including competitors) definitely did not help the situation and only fueled certain viewers’ ire toward TV5’s kapalpakan in hosting the debate or toward TV5 itself, just because. While chaos was brewing in Cebu, calm professionalism was on display back in Mandaluyong City and on TV. Kudos are definitely well deserved for News5’s Cosim, Atty. Sta. Maria and Alampay and Professor Manhi who were able to turn what was supposed to be a 30-minute “pre-game”/pre-debate discussion into a two-hour analysis on the current campaign and a cautious, but transparent reporting of the cause of the delay. 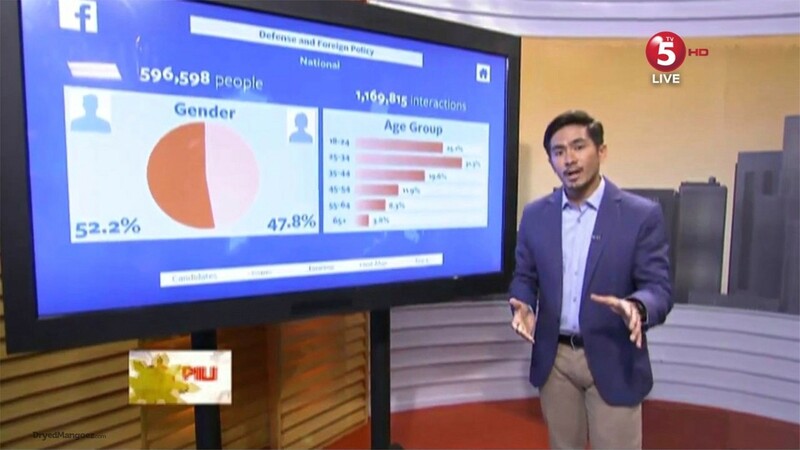 Even Renz Ongkiko’s Facebook Analytics segments were much more informative and seamlessly woven into the coverage than GMA News’ incessant harping on “trending” topics and mood meters. While some viewers were already hate tweeting (the anchors even read some out loud), this two-hour presentation by TV5’s on-air talent turned out to be just the first display of professionalism of the night by the network and its news division. They were careful not to engage in speculation. And it’s been proven many times in the past (especially in the Philippines), once something is put out there, any subsequent corrections or details do not matter to the already formed conclusion based solely on the first and unsupported bit of information. The implication of this tweet is very clear. And this is only one of the irresponsible reports made by many different news organizations. Equally measured and informative analysis before, during and after the debate. With the whole “notes”/”docus” mess, there really isn’t only one entity that should shoulder all the blame. Certainly Ms. Luchi Cruz-Valdes is at fault for giving an answer she may not have been sure of. Certainly the Binay campaign is at fault for directing their query to Ms. Cruz-Valdes instead of COMELEC (Philippine Commission on Elections). But actually, maybe that one entity should be COMELEC who is at fault for being completely incompetent. COMELEC is the common factor between GMA’s absurd “debate” and TV5’s debate. And COMELEC will be involved in the upcoming CNN Philippines vice-presidential debate and the final presidential debate on ABS-CBN. In the United States, the Republican and Democratic parties and candidates agree to the debate rules set forth by the host network. But apparently in the Philippines, COMELEC controls most of everything. That includes what the network can even put on the air. In the minutes leading up to the debate actually starting, Cosim and Alampay wondered out loud why they couldn’t even show a live shot of the debate hall. And it appeared, without COMELEC approval, TV5’s hands were tied. Hmm. Seems like COMELEC ties hands quite frequently. Now COMELEC’s had its share of well-publicized problems over the years and in every election. But specifically to the handling of these debates, COMELEC has controlled and dictated every aspect. From format to network hosts to topics discussed, COMELEC has final say. That fact was on full display during the starting moments of this TV5-hosted debate. The visibly exasperated Cosim and Alampay basically telling the impatient TV audience that they were at the mercy of COMELEC’s decision. And judging from the pre-debate footage aired after the debate, COMELEC was just as indecisive when it came to the big controversy. You know the type. We all do. The boss who is afraid to take responsibility or make a tough decision and instead dumping that decision onto a lower-level manager or employee. That was exactly what COMELEC appeared to be doing to TV5/News5 as the heated discussion over rules transferred from a holding room to the main stage. Couple that with the mess of a first debate, the people currently in charge at COMELEC seem to be either inept or oblivious. And I must continue bringing in the US presidential debates because they provide examples of how these things should work. It should be the network’s discretion what topics are discussed and to whom questions will be addressed. What’s apparent, however, is that COMELEC has blanket authority over the debates and their content. And that’s certainly dangerous if we care about freedom of the press. But in spite of that, TV5 was able to deliver what one would consider a true debate. It was arguably on par with the American presidential debates, both in format and in how stubborn candidates were. This debate was also just as substantive. The questions asked of candidates pointed at specific policy issues and positions of each candidate. The News5 panelists, at times, attempted follow-up questions. But unlike the first debate, this time, candidates were more than willing to engage with each other. Surprisingly, a large portion of Filipino voters were appalled by what they were watching. Some preferred GMA’s “civil” debate. Others preferred GMA because they are Kapusos. But for those who actually preferred this debate, a common theme in their praise was that this was indeed a debate. A true, blue presidential debate. It was actually very sad to see so many Filipinos are unfamiliar with what a debate is supposed to actually look like. 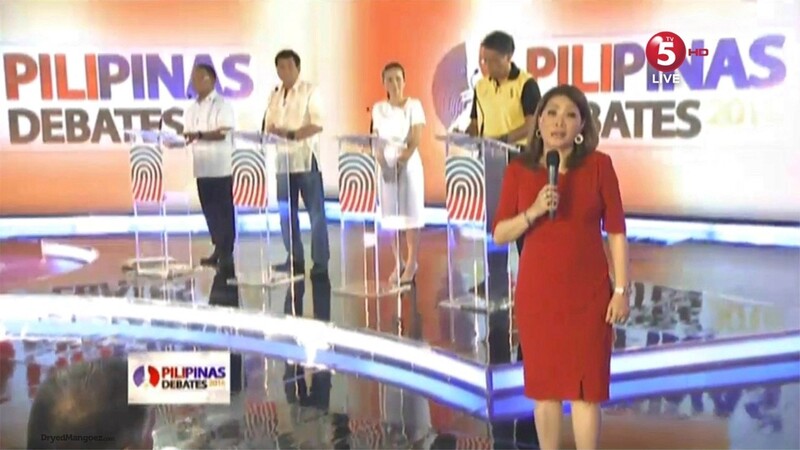 What was most interesting, however, was while the candidates eagerly took the opportunity to hit and hit back at their opponents, some seemed to criticize the format and TV5 as host. Snarky comments and implications of bias from the candidates were in direct contradiction to their newfound willingness to attack and defend. Or simply put, actually engage in a true debate. It’s fascinating to see examples of both from all candidates during their three hours on stage. All four candidates fought for their time to speak. But certain candidates still seemed to take issue with the format and dropped snarky, overtly critical comments against the moderator and host network. And I have no problem being specific. 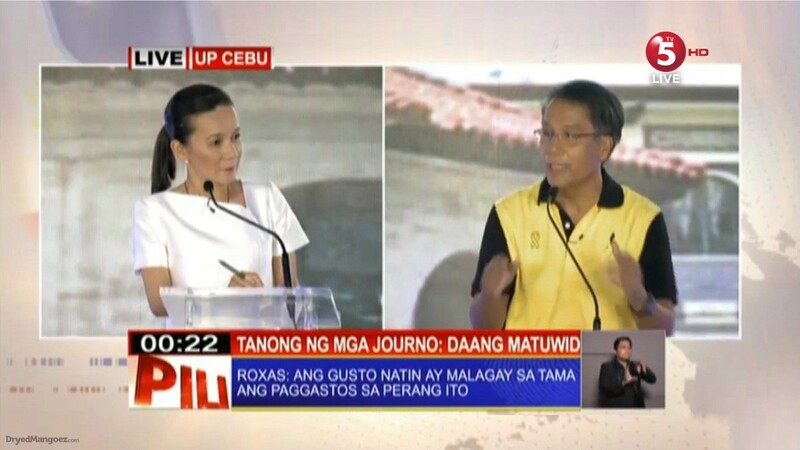 During the debate, Mar Roxas quipped “Mataas rating niyo dito.” in response to a heated exchange. Without any more context, that would seem like an innocent, witty remark. But there’s plenty of context that may give more meaning to it. Mar Roxas is of course married to (currently on sabbatical?) ABS-CBN anchor and host Korina Sanchez. And as mentioned earlier, ABS-CBN is routinely criticized as being an Aquino-leaning network. TV5’s ratings woes are no secret. And indeed, many Filipino netizens also made similar jokes, even before the debate began, about TV5’s ratings with regards to the debate. But the other piece of the puzzle lies in the pre-debate footage TV5 aired after the debate proper. During the continued discussion over Jejomar Binay’s “notes” and “docus,” Mar Roxas appeared ready to pounce, poised to call out TV5, News5 and Luchi Cruz-Valdes (who had already admitted her mistake, apologized and attempted a solution) as being biased, unfair or being outright promoters of cheating the rules. So going back to the “Mataas rating niyo dito.” remark, Mar Roxas went into this debate with a clear disdain for the host network. And throughout the debate, it was clear he did not appreciate the format that brought about opportunities for challenge. This was in response (unprovoked) to Luchi Cruz-Valdes trying to steer the conversation between Binay and Rodrigo Duterte from calling out politicians for corruption back to the original topic of taxation on low-income workers. So… how does Poe’s comment make any sense here? Is she too taking issue with this format? Or, judging from the minutes before this comment, maybe she is taking issue with Cruz-Valdes’ attempt to moderate the debate. Again, a moderator controls and steers discussion during a debate, most especially when things get out of hand or the participants are using their time for saying things unrelated to the question or topic or as a response to an attack. In this instance, Binay and Duterte were in the process of tag-teaming Roxas. And of course, it is only natural for a person (in this case Poe) to happily watch someone else get blood on their hands to attack a mutual rival. Cruz-Valdes’ point on avoiding making accusations toward people not present in the debate hall was completely valid. What wasn’t valid was Binay contesting the invocation of his son’s name in the debate. Lourd de Veyra’s question was a valid one in which he asked what Binay would do as president if his son is convicted of crimes. Binay gave a perfectly reasonable answer to that question, no problem. But Binay taking issue with the mention of his son’s name later is quite ironic (and hypocritical?) considering he brought up Senator Miriam Defensor-Santiago’s son during one of the few actual exchanges between candidates in the first debate. Next, there was plenty of talk about the rule of law. But specifically, much talk about following the rules of the debate. We know the other three candidates, to varying degrees, took issue to Binay’s misunderstanding of and later insistence on not adhering to set rules. Again, Binay and his campaign are not without fault with that issue. But it’s very interesting to note that the other candidates had no problem looking for loopholes or trying to circumvent the rules to benefit themselves as well. First off, it was fascinating watching Grace Poe repeatedly balking at the idea of a three-hour debate. A three-hour debate being part of the format all candidates agreed upon. It was all very Trumpian, seeing Grace Poe basically telling TV5 this whole shindig better end at 8pm, regardless of what time they actually start. That is instead of getting the full three-hour debate that I think most Filipino voters would agree they deserve. But the most egregious and arguably most hypocritical moment of the debate came at this moment. This was during Round 2 of the debate in which each candidate got the opportunity to pose a question to the candidate next to them. According to the much-talked-about rules, this round would only involve face-offs between two candidates. The two non-participating candidates would not be able to insert themselves into that face-off. Yet, both Binay and Duterte wanted to add their two cents to the exchange between Poe and Roxas. Luchi Cruz-Valdes naturally said that was not part of the agreed upon rules. At this point, the candidates looked to change those rules right then and there. Cruz-Valdes, in a valiant effort to make everyone happy, moved to ask each candidate if they would approve this new, last-minute modification of the rules. She started with Roxas (the target of the impending three-pronged attack) who of course didn’t want to risk getting absolutely killed (not literally, I think) on stage. Just when it was believed everyone was ready to move on, Poe pushed for majority rule. Again, maybe hoping to get some help in her offensive against a competitor. Once it appeared the issue was settled and everyone was ready to move on… the candidates were not. It was probably the most embarrassing display by all four candidates in what had otherwise been a spirited and lively debate. And spirited and lively it was. 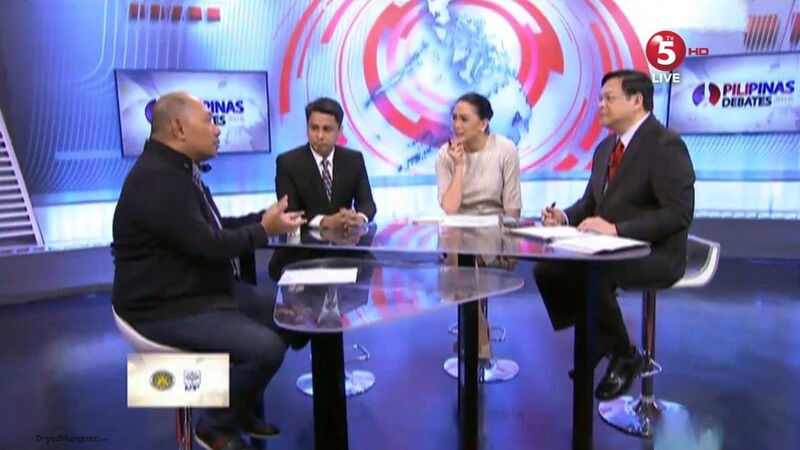 Judging from an unscientific glancing of tweets and Facebook and YouTube comments by both regular people and fancy celebrities, TV5 put on a successful and true debate. There was something for everyone. For the policy wonks, the candidates talked about and defended their ideas and positions. And they challenged each other on the same. For fans of TV5’s late, great Face to Face/Face the People, they got some fiery exchanges. For everyone, the debate allowed voters to actually hear the candidates without filter. And with the various bits of drama and “diva”/pabebe behavior, voters also got to see more of the candidates’ character and personality without the careful and watchful guidance of campaign advisors. In just about every aspect, this second debate was better than the first. On its own, it was a successful debate in spite of and maybe even because of everything that happened in the weeks and seconds before it actually started. Moving on to the next presidential debate, netizen chatter is already expecting a Roxas-leaning ABS-CBN program. But again, you just can’t judge before it actually happens. While criticism of ABS-CBN News can be valid or not, any question about their hosting of the last debate can be dispelled with the right moderator and the right people in charge of putting it together. Like I said, COMELEC needs to magically get their act together in one month. But for ABS-CBN’s part, they can choose a fair moderator who will also be able to challenge candidates when necessary. 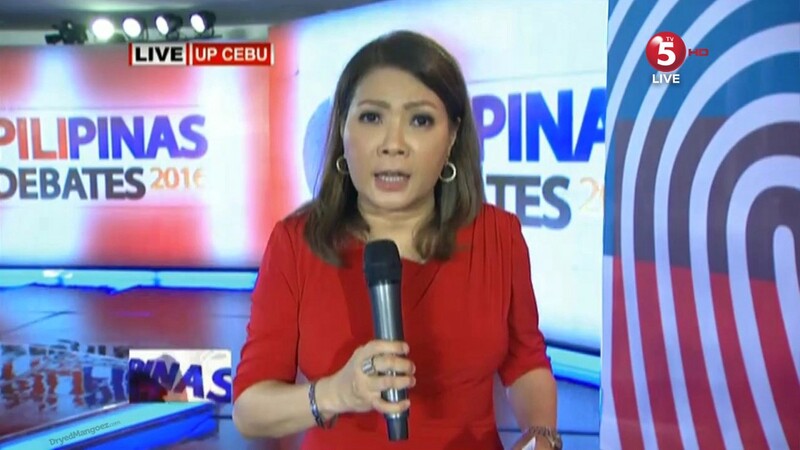 There’s Tina Monzon-Palma, a steady hand at ABS-CBN News and a well-respected veteran who remains one of the best in the business. And there’s also Karen Davila, another experienced vet who has already conducted headline-grabbing interviews with political candidates this cycle. ABS-CBN News also needs to have the people behind the scenes understand the idea of fairness and leaving out personal political biases as both GMA and TV5 have so far done well. The only real question though is that ABS-CBN’s debate will supposedly be in a town hall format. (At least, a “town hall” according to whatever random, nonsensical definition COMELEC adheres to.) They can get audience questions (which should absolutely be vetted before the debate), but the moderator(s) should also have their own set of questions ready as well as possible follow-ups in whatever topic list COMELEC will have agreed on leading up to the event. Luchi Cruz-Valdes may have made a huge error in judgment in the last week, but she certainly made up for any lapse by firstly taking responsibility for her actions. And more importantly, doing her job of moderator as best as anyone could, especially with the circumstances and the people sharing the stage with her. And in agreement with much of the internet, I believe Cruz-Valdes deserves all the kudos and all the figurative applause coming her way. Well then! Different people have different opinions. That’s a given. And people will see things how they want to see things. Bias is a word that has been thrown around in the Philippines so much, it’s easy to think that maybe it’s lost its meaning. Or rather, Filipinos have forgotten what it means. Otherwise, the Tweeters and Facebook commenters and Instagram posters would realize that maybe they too are biased. In fact, we all are. It’s inherent in whatever we type out before clicking whatever variation of “Send” there is, according to the platform. It’s a problem when rational thinking is overpowered by fanaticism and “network loyalty.” It’s a problem when it comes to simple entertainment issues. And it’s certainly a problem when these same people have the country’s future in their hands. So this debate has opened a floodgate of discussions. Discussions that will certainly not get resolved before the next debate or even before the actual election. But most importantly, this successful debate is a reminder that knowledge is definitely power. From simply knowing what a “debate” actually is to being cautious about making snap judgments before knowing all the facts. Not letting being a fan of something blind yourself to basic truths and fairness. They’re all things that Filipinos and non-Filipinos alike should remember, especially when it’s all our futures that’s at stake. ← Recap: Power Rangers Dino (Super) Charge, Episode (7) 27 – "I like to hit hard."